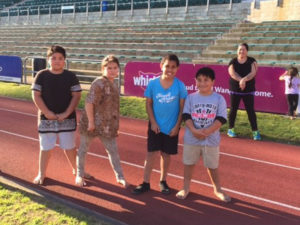 The Active Families programme introduces the family/whanau to appropriate affordable and sustainable physical activity & nutritional options and gives them the opportunity to interact with other children and families in similar circumstances. The Green Prescription Active Families survey is an ongoing evaluation of the participants in the Active Families programme. Early results show the key performance indicators of the programme. The survey seeks the views of participants about how well the programme worked for their child and family. Click here to view full survey results! i.e. Paediatrician, GP, Practice Nurse, Maori Community Nurse, School Nurse, Occupational Therapist or Dietitian & self referrals. The Active Families Coordinator will make contact with the family and arrange an appropriate time to meet with the family. During the first meeting, the “Active Families Programme Agreement” is explained to the child and family and then signed. Monthly contact will then be provided by the Active Families Coordinator and discussions will be held on barriers to physical activity and how to overcome them, setting goals, explaining programme options, links to other groups and programmes, educating about healthy lifestyles and being more active, more often and building confidence. The family will be part of the programme for 12 months with reviews undertaken on a quarterly basis.Three months after the family has left the programme, follow up contact will be made to determine if the changes made have been successfully maintained. Vegetables: Vegetables are important in your meals for vitamins and taste. Frozen or tinned veges are just as good as fresh, try throwing frozen mixed veges into soup or grating carrots into mince to make the meal go further. Fruit: Fruit is also a healthy and tasty snack or desert, tinned fruit is a good option if you pour off the liquid. Breads and Cereals: These are low in fat, filling and give us energy, but be careful what you add. Wholegrain, wholemeal or wheatmeal breads are healthier, more filling and you won’t need to eat as much. Meat, chicken, fish and alternatives: These are important for protein, but too much is not good for our bodies. Using less meat will cut costs too. Cut off the fat from the meat or skin from the chicken before you cook it and add sauces and herbs for flavor. Milk and dairy products: These give us calcium to keep our bones strong. Swapping to a low fat variety can cut your fat intake down as well. Use full fat milk for kids under 2 years old. Water: Water is the best drink for the family and it’s free. Drink plenty throughout the day. Use the car less and your legs more. Do activities as a whanau, such as walking, playing in the park, kicking a ball around, setting up an obstacle course in your backyard. Aim to do games, sports and activities that get you feeling slightly breathless and feeling warmer. 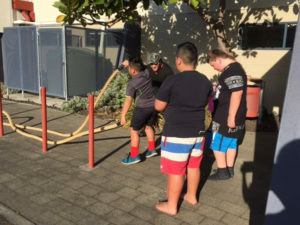 Parents – lead by example, be a role model for your Rangatahi. Most important – make it FUN!